Bible designed for those who appreciate larger type. The King James Tradition continues with this easy-to-read and easy-to-carry Bible designed for those who appreciate larger type. 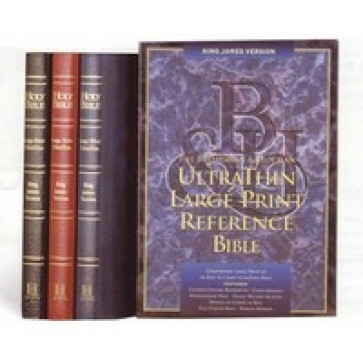 Words of Christ in red, presentation page, center-column references, family records section, full color maps, type size 10.5 and measuring 9 ¾"X7". Ultrathin thickness only 1 ¼". Please call for gold stamping.